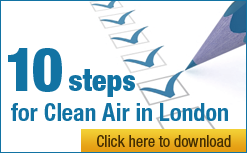 Today, the Campaign for Clean Air in London (CCAL) joined 10 leading environmental and health based organisations (NGOs) in writing to the Prime Minister urging a Government commitment to comply fully with the European Union Directive on ambient air quality and cleaner air for Europe (the new AQ Directive) which entered into force on 11 June 2008. CCAL has written today to Mayor Johnson also inviting him to make a similar commitment to ensure full compliance with air quality laws in London and to make a public statement in support of the NGOs’ letter to the Prime Minister. The provision of a healthy environment is one of the Government’s greatest responsibilities to protect citizens. Despite this, levels of air pollutants in many parts of the UK are substantially in breach of the health and ecosystem standards set in the Air Quality Strategy for England, Scotland, Wales and Northern Ireland and are currently expected to remain so for some time. We, the undersigned, believe that the recent approval of the new European Union Directive on ambient air quality and cleaner air for Europe gives you the opportunity to make a clear and unequivocal public commitment that the Government will ensure full United Kingdom (UK) compliance with it. We urge you to consider going further by committing the Government to improving human health and protecting biodiversity, the environment and historical sites by complying with laws concerning emissions to air generally: whether for the purpose of fighting climate change; improving air quality or otherwise. If the UK does not meet its short-term obligations for air quality, what chance is there that it will meet five-year carbon budgets and longer-term commitments introduced in the Climate Change Bill? An unambiguous commitment now from the Government backed thereafter by prompt and meaningful action will give stakeholders of all types, whether from business, the non-governmental sector or citizens generally, the certainty and time necessary to play their full part in delivering the required changes in the most cost effective manner. “The new European Union Directive on air quality sets a robust framework to move Europe towards meeting World Health Organisation (WHO) recommended standards of air quality. “The Directive would not be needed if the UK Government had shown the political will necessary to achieve, on its own, WHO recommended air quality standards and comply with earlier, similar, Directives going back to 1999. “With the Government in ‘denial’ about the UK’s serious air quality problems, Londoners and others will depend on the European Commission enforcing rigorously the new air quality laws. 2. The new EU Directive came into force on 11 June 2008. It will merge and streamline four existing EU directives and a Council Decision in a single text to become Europe’s main air quality legislation for 12 regulated pollutants including nitrogen dioxide (NO2), ground-level ozone (O3), particulate matter (PM10) and sulphur dioxide (SO2) while setting new objectives for fine particulate matter (PM2.5). It will modernise reporting provisions and provide a framework to address breaches of air quality laws that have taken place since 2005, which were set in legislation in 1999, for which no time extensions were allowed. 3. Air pollution has impacts on human health ranging from minor effects on the respiratory system to reduced lung function, asthma, chronic bronchitis, cardiovascular disease and reduced life expectancy. Air pollution in the EU, most notably from fine particulate matter and ground-level ozone, causes the premature death of almost 370,000 citizens every year, reducing average life expectancy by an average of nine months.